It has been said that “a man is known by the company he keeps.” And Larry Dean Milligan kept excellent company – from his dear friends who are lawyers, business people and advocates, to the homeless men, women and children whom he befriended and championed, to his partner, Johanna Argoud, and their family whom he loved with all his heart. In 2004, largely through Larry’s efforts, the lawsuit, Spencer v. San Diego, was filed to protect homeless people from illegal lodging tickets. Larry was victorious when this lawsuit was settled in 2006 and homeless people were allowed to sleep outside on public areas in the City of San Diego from 9pm to 5:30 am without being ticketed by the police. And now a few words from the members of the excellent company that Larry kept. • Liza Elliott writes, “Johanna and Larry ran a weekly feeding program for the homeless in Balboa Park. I worked with them there as well as at the TACO Feeding program at the Lutheran Church. We did sit-ins at City Hall, served pizza, beans and rice to the homeless and had lots of fun. “Larry and Johanna were tireless advocates for the homeless, and it was my pleasure and honor to have served with them. • Scott Dreher, Esq., Dreher Law Firm, co-counsel in Spencer v. San Diego feels “Larry was the last of the true Hippies with all their altruistic, idealistic spirit, and he never lost sight of our society’s potential. “Indeed, Larry promised to give up his Hunger Strike only if we agreed to file the Spencer case (which resulted in voiding the City of San Diego’s policy of issuing “sleeping tickets” to homeless people in violation of the state and US Constitutions). His organizing skills were invaluable in convincing the court and city to resolve it in favor of homeless people! He was a vigorous advisor and a loving voice for the homeless to the end. “He called me a couple weeks ago, and his voice was filled with enthusiasm, energy and readiness as he put forth more ideas on trying to fix the social imbalance that allows people in our country to lack basics such as food, a place to sleep, and shoes. “I joked with him and told him we’d carry on as long as he promised not to go on another hunger strike. “Larry was a great spirit whom I first met in the mid 90’s when we were handling a case against the city of San Diego for failure to designate or site emergency shelters and transitional housing (Hoffmaster vs City of San Diego) – he kept me and others informed of the conditions as he saw them on the street. “At one point he went on a hunger strike and some believe this contributed to his later health problems. • Steve Binder, Esq., San Diego Deputy Public Defender says, “Larry had the unique capability to bridge the discussion between the police and people on the streets and to help people realize that citations alone are a simple solution to a complex problem that continues to frustrate police and the people who receive the citations, alike. “Larry had the ability to look past the shortcomings and problems that the police presented to the people on the streets and to look past the shortcomings and problems that the people on the streets presented to the police so that he could improve everyone’s situation. • Jim Lovell, Executive Director, Third Avenue Charitable Organization, Inc. (TACO) notes, “Larry was an amazing force brought to bear on San Diego. His faith seemed to be what drew him to need to call those in power to act to treat all who live in their city with the same dignity that those who were wealthy and who had power were treated. “When Larry fasted in order to get the city to open the winter shelter early, he was quick to point out that it was a “fast, not a hunger strike”. “When Larry would come to see me, I quickly learned that I should hold on tight because things would move very fast, and we may go to see a council member or we could be at the mayor’s desk with signatures to record turning in or we may be in the office of the Chief of Police. “Larry often verbally argued and pushed those in power, though he was always so quick to forgive and call them again and ask to meet. That was one of the most amazing parts of Larry. Thanks to Larry, even though I had never had the pleasure of his humanist company, I had none the less benefited greatly from the out come if his Spencer v. San Diego for several months in 2009. Anyone who could accomplish this task let alone attempt the “Powerful Retards In Control for Kickbacks” (P.R.I.C.K. )’s behave within the constitutional laws is beyond the normal, that being the belief that we don’t have to mean, humanist. Thanks for dealing with all those people and getting the law suit passed. Malcolm, Thanks for your comment. I never had the pleasure of meeting Larry, either. However, I had a lengthly telephone conversation with him before his double lung transplant close to two years ago. 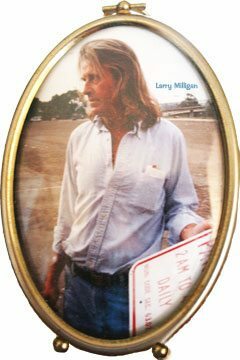 I will always treasure that conversation I had with Larry Milligan. Thanks Christine for this enlightening and wonderful writeup about someone who truly cared for those less fortunate. What an example for us all! He died too young, as there’s still much to do for those who need his, and now our, help. A beautiful sentiment – the passing of the torch from Larry Milligan to us. And what a legacy for Larry to have inspired people he knew and even people he never met!